March 1, 2010 By Denny Hansen & filed under All Articles, Handguns, Weapons. Ever since I received my first rifle when I was a young boy, I have liked shooting .22s. They are economical, usually very accurate and just plain downright fun. In the last year, however, my main focus with the double-deuce cartridge has been on the first reason: economy. I’ve put literally thousands of rounds downrange through my Olympic Arms Partner (HOWDY PARTNER: Olympic Arms Dedicated .22 LR Upper Receiver, October 2008, S.W.A.T.) performing sustainment training with an AR-type carbine at a fraction of the cost that 5.56mm/.223 ammo would have cost me. 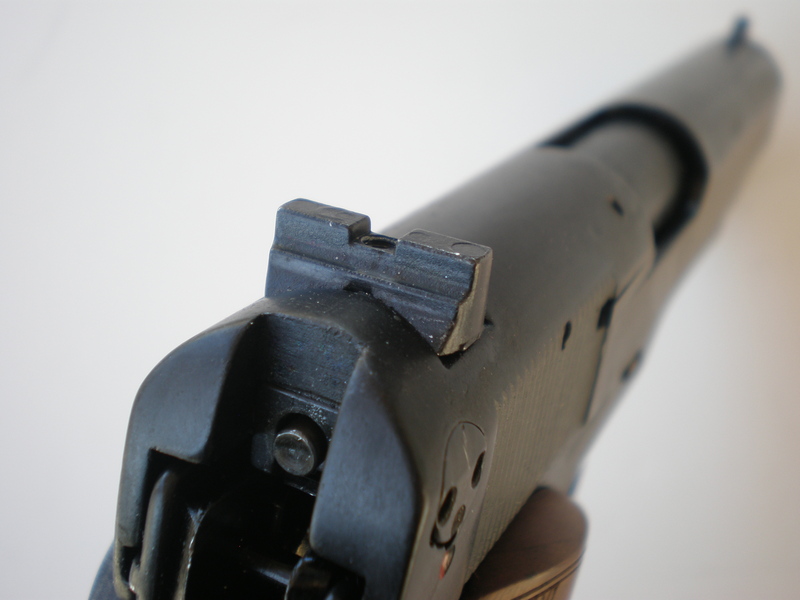 Rear sight is a standard square notch, adjustable for windage. Although all skill with firearms is perishable without practice, for me at least, it is more so with a handgun than a long gun. With that in mind, I had seriously considered purchasing a .22 LR conversion kit for my 1911 pistols, but for one reason or another put it off. I recently received a press release for our Gear Locker department on a 1911-type .22 LR pistol made by Chiappa Firearms. Rather than run the press release, I decided to order the pistol and evaluate it. If the pistol ran well, I would have fulfilled my wants for a .22 trainer. Field stripping is similar, though not identical, to a standard 1911. Fixed barrel may have contributed to excellent accuracy. The Chiappa Firearms Model 1911-22 arrived in a padded, lockable plastic case and included a cleaning rod, a key for the manual safety, two magazines and the obligatory instruction manual. The Model 1911-22 is manufactured from an alloy that Chiappa calls Chiappalloy, though steel is used on some components. Stocks are wood and checkered with a double diamond pattern. Overall dimensions are the same as a Government-type 1911 though, due to the alloy frame and slide, the 1911-22 weighs about six ounces less, tipping the scales at 32 ounces. All controls are in the same location and operate in the same manner as any 1911 pistol. Note hammer spring in notch in hammer. 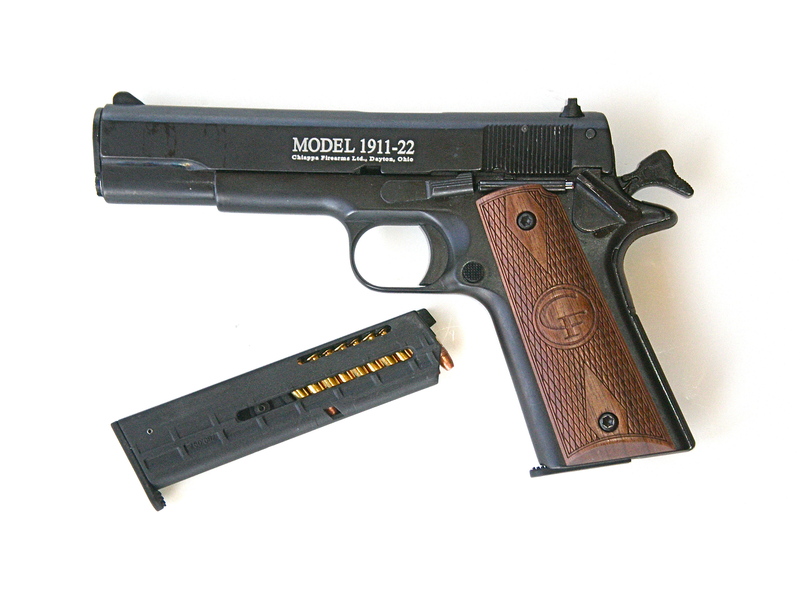 The 1911-22 has a black finish. The test gun was the standard version with a fixed front sight and square notch rear sight, drift adjustable for windage. A target version with a fully adjustable rear sight is also available. Capacity is ten plus one. Controls. including the thumb safety, slide lock and magazine release, are located in the same positions and operate in the same manner as a standard 1911, giving the 1911-22 the same handling characteristics as the original. Additionally, there is a manually operated key safety on the right top rear of the slide. When engaged, it prevents the hammer from striking the firing pin. 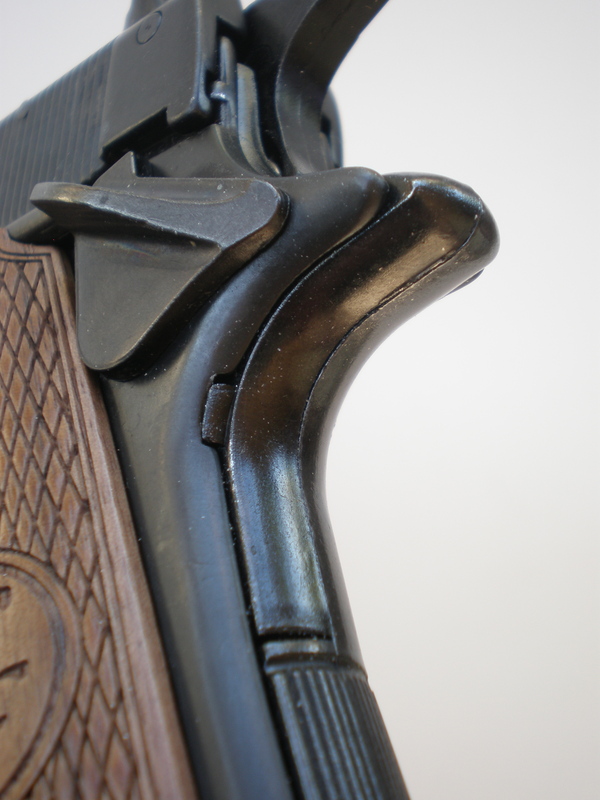 Internally, the 1911-22 departs from the original 1911 design, including the fact that the barrel is pinned to the frame. The pistol uses an external-type extractor and the grip safety is non-functional. 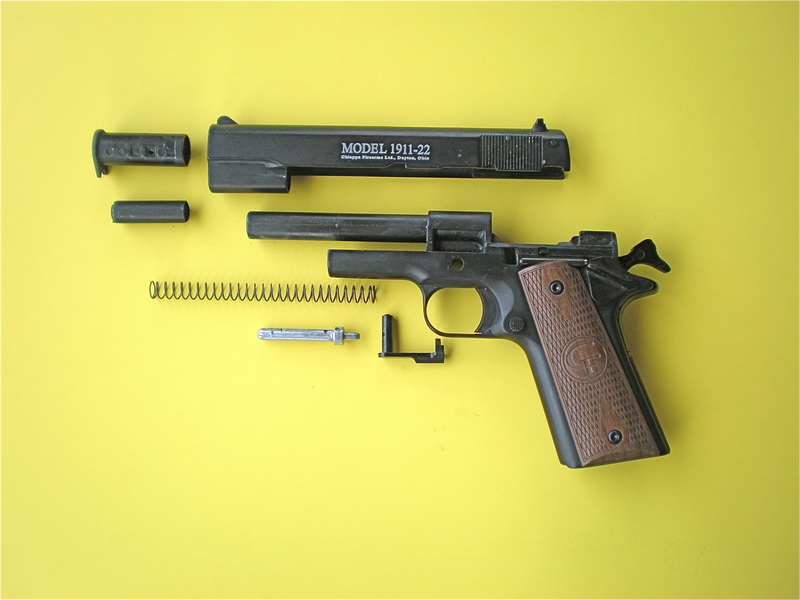 Due to the pinned barrel, disassembly is similar, though not identical, in nature to a standard 1911. In evaluating the Chiappa 1911-22, I found that it will fit in any holster that is made for its big brother chambered in .45 ACP. Since the .22 magazines are not as thick and wide, there will be some wobble if they are used in a .45 magazine pouch, though this will not be a factor for informal training/plinking. The trigger on the test pistol was heavier than on any of my 1911-type pistols, breaking at around eight pounds. The magazines that came with the Chiappa Firearms pistol had fairly light springs, and no loader or thumb stud is necessary to easily load them. It is a family tradition to go to the range on Veterans Day, and this year was no different. My “official S.W.A.T. Magazine test crew” for the first firing of the 1911-22 consisted of my eight-year-old grandson Austin, nephew Paul Elmer, brother-in-law Dan Elmer, and myself. Austin also brought along his Chipmunk .22 rifle (nicknamed “Alvin”) and I brought my Olympic Partner .22 AR. While Dan and I did manage to get off a few rounds, we were quickly relegated to the role of loading magazines. In short order, the boys were hitting targets of opportunity that included plastic bottles, cans, and fired shotgun shells at distances from ten to 20 yards. They were also hitting a large steel plate (approximately 20×20 inches) at an estimated 70 yards with boring regularity with both the rifles and the 1911-22. 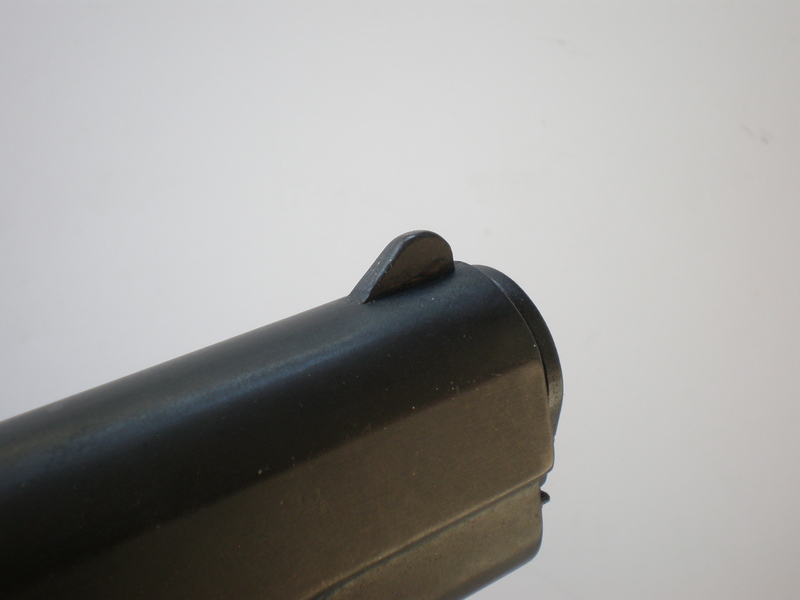 Both magazines dropped freely, and in spite of the light springs in the mags, the slide lock operated perfectly and held the slide to the rear after the last round was fired—every time. After 550 rounds, the 1911-22—although filthy by this time—was still chugging right along. The only malfunctions occurred when 11 rounds were placed in the ten-round magazines. Manually operated keyed safety prevents hammer from striking firing pin when engaged. I have mixed feelings about using a .22-caliber pistol for training. On the one hand, the perceived recoil is so very minimal that quick, multiple shots amount to not much more than ballistic masturbation. Parenthetically, practicing getting one good, fast hit from the holster out of a gun that is nearly identical to your regular carry piece can yield productive results. 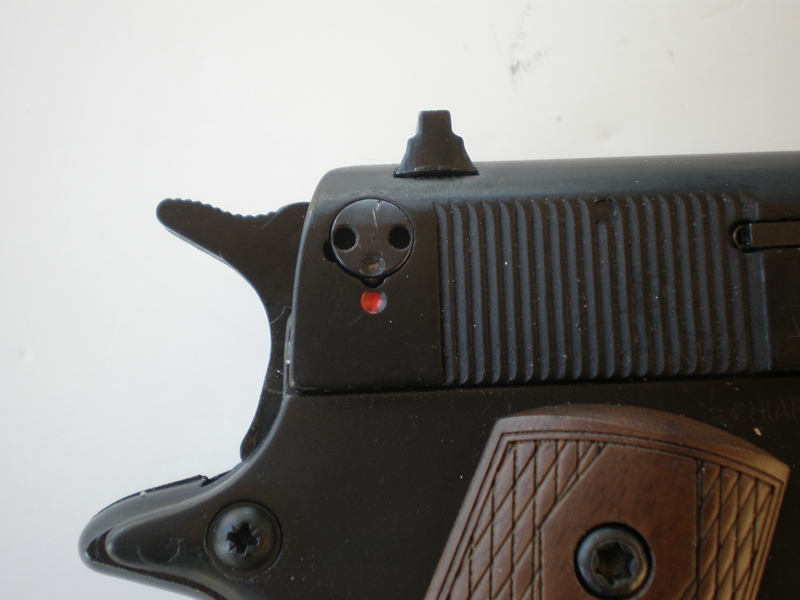 Front sight has enough material to remove for adjusting point of impact if necessary. Likewise, shooting on the move can be improved through using a .22 because it is not just shooting, it is shooting and moving. Add in some speedloads while shooting and moving, and one can get in some good training for pennies instead of dollars—and you won’t wince every time a round does not hit where it was intended to strike. With a suggested retail price of $299, the Chiappa 1911-22 sells for less money than many 1911 rimfire conversion kits. That translates into a bargain considering the reliability and accuracy of the piece. Also important, at least to me, is the fact that the pistol is a dedicated pistol for the .22 vice a conversion kit. Yep, I think this one is a keeper. 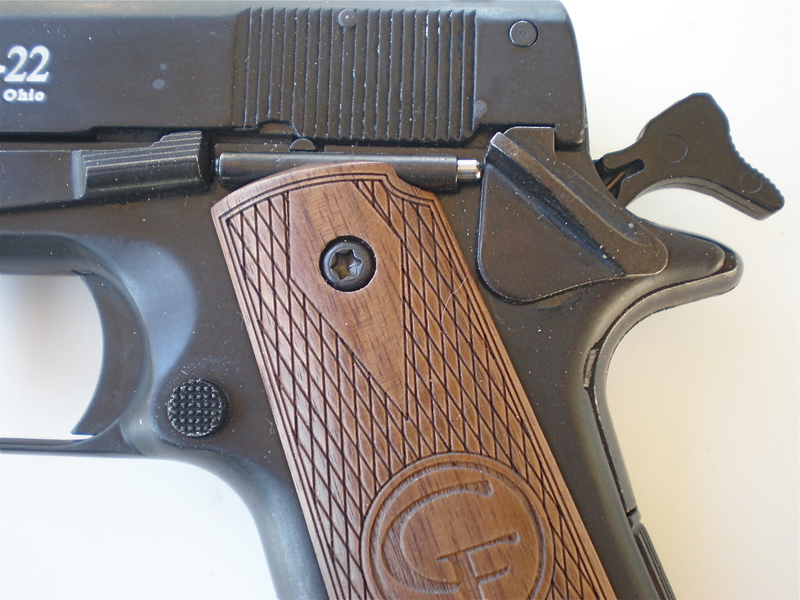 Any holster made for a 1911 will fit Chiappa Model 1911-22. 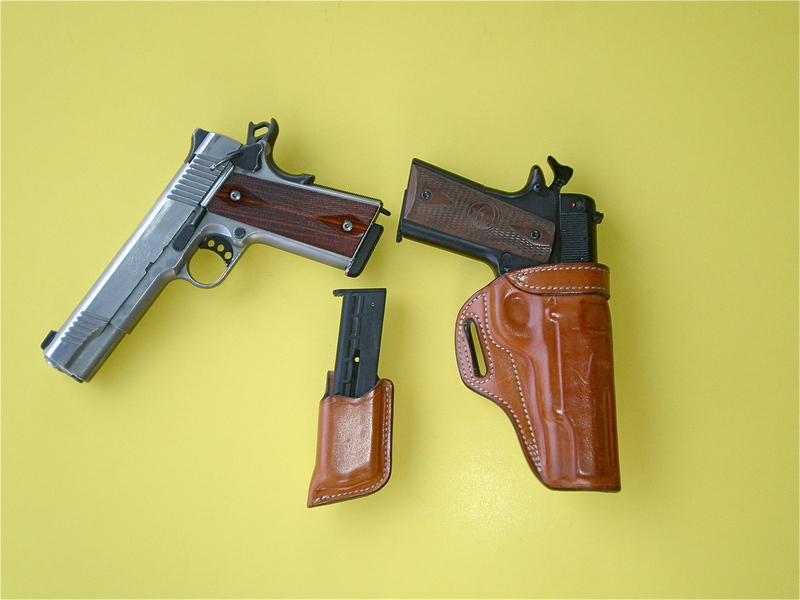 Shown is Rafter L Gunleather Model 1 holster with Kimber Custom Classic carried by Hansen daily. Chiappa’s .22 magazine is not as wide as a .45 mag, but most pouches made for a 1911 are suitable for informal training/plinking. Pouch shown is Rafter L’s #1 single magazine pouch.